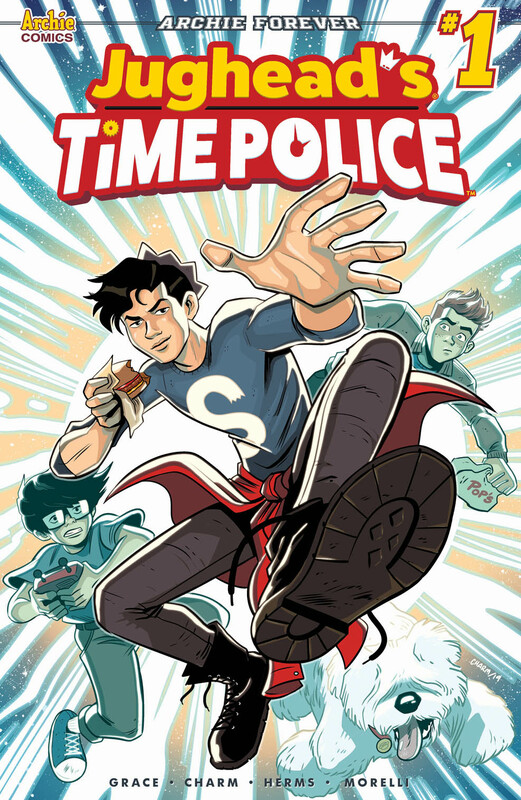 Lots of interesting things coming in June from Archie, including the first issue of the new Jughead's Time Police mini-series. How did the worlds of JUGHEAD: THE HUNGER and VAMPIRONICA come together? Meet Jinx... who may be the most powerful being in either universe. Is she good? Bad? Whatever she is, she may the only one to hold the key to fixing the two realities and prevent an all-out werewolf/ vampire war! Archie and Sabrina are the hottest couple in Riverdale--but how did their whirlwind romance come to be? This issue introduces readers to the history of their magical love story, as we welcome special co-writer Mariko Tamaki to the Archie universe! The comic based on the hit CW series is back! These two stories set between episodes of season 3 of Riverdale are filled with thrills! First, Betty is caught up in a dangerous pact with someone way too close to home, then #Veggie stave off terror on the high seas when an overnight on Ronnie's boat goes all kinds of wrong. As danger intensifies and mysteries deepen in Greendale, Sabrina finds it increasingly difficult to keep her own secrets. 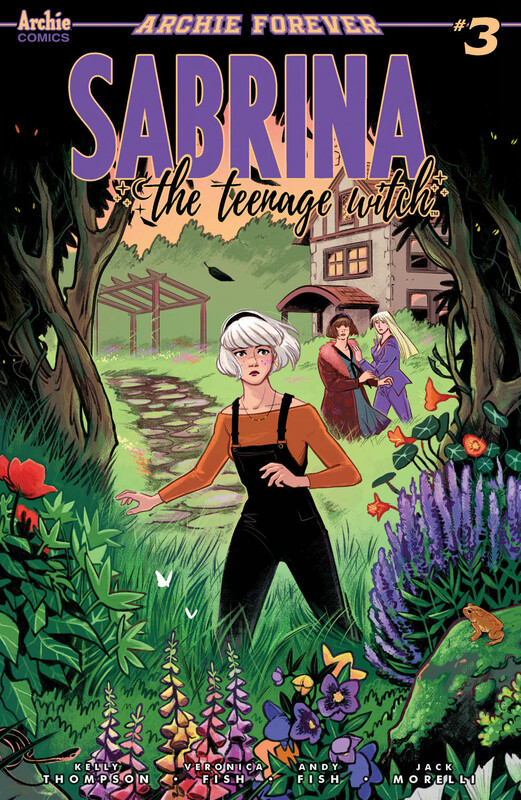 And while the whole town is on edge from the most recent "monster" attack, Sabrina has tracked the source of the disturbances back to her high school. It may be up to Sabrina to save her new town by solving this one her own... but when the secrets she uncovers hit too close to home she'll have to make some very tough choices. BRAND NEW STORY: "His Days are Numbered!" The number 300 seems to be following Archie everywhere! Is it just a coincidence, or is something unusual going on? 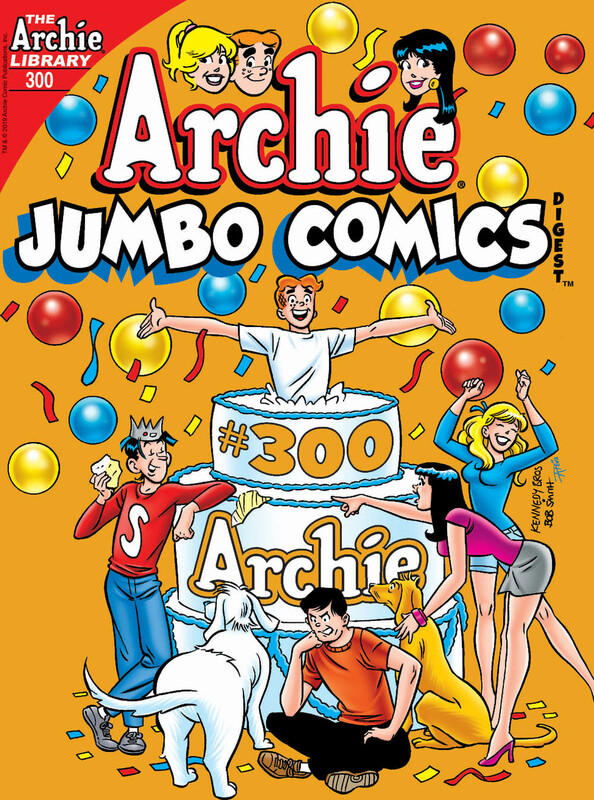 Join us as we celebrate 300 issues of the Archie digest! BRAND NEW STORY: "Saturday Knight!" Archie doesn't have any plans for his Saturday night--so he spends it around town, enjoying some "me" time--but Archie's solo adventure might just make him the most popular guy in town! 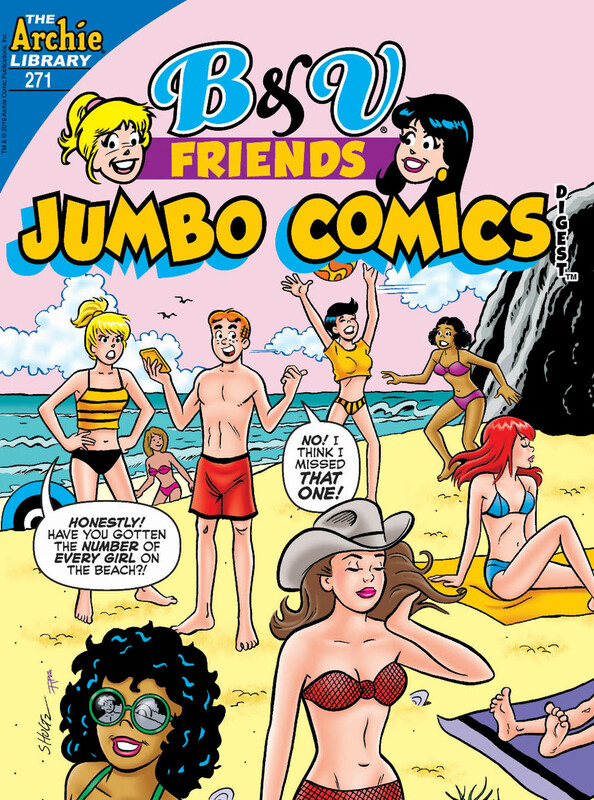 Get ready for fun in the sun with Archie and his pals 'n' gals! 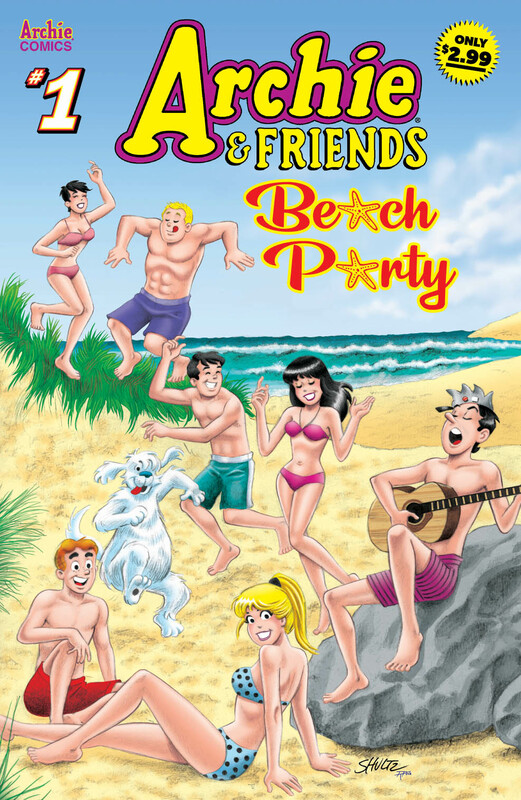 This new issue of Archie and Friends features an epic beach party with an unexpected guest, a water skiing mishap, a beach movie starring none other than Archie Andrews... and more in this collection of classic-style summer stories! 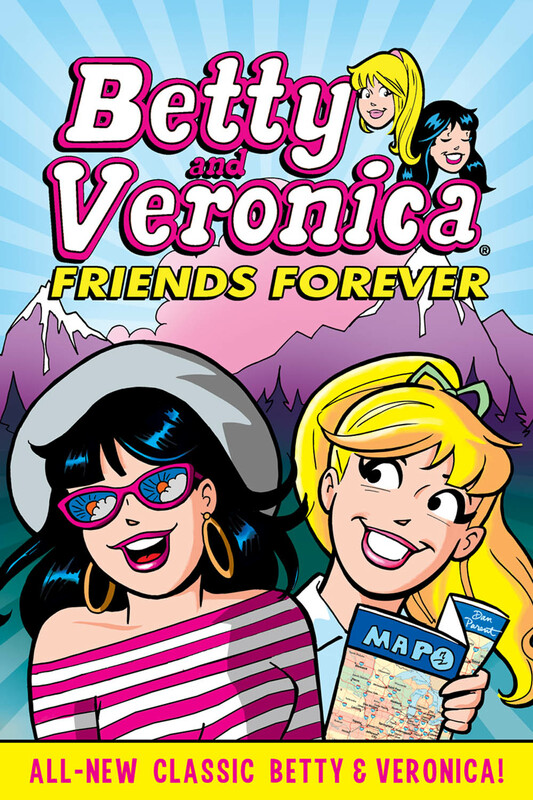 Classic Betty and Veronica stories are back with this collection of tales that see the two iconic BFFs travel the world and get into all kinds of international adventures--loaded with friendship and fun! BRAND NEW STORY: "A Squeak from Beyond!" A fun night at the Lodge Mansion gets a supernatural twist when Veronica gets everyone to try to communicate with others from the great beyond! But will everyone be convinced of Veronica's new abilities? BRAND NEW STORY: "Fortunately Enough!" Betty and Veronica consult a psychic about their love lives--but will they like what the future has in store for them and their red-headed love interest? Yes, this trade paperback collection of a reprint series is all-new! The art on this cover is really weird. I dare say even Cheryl isn't attractive. I thought the cover art there was weird too. A bit surprising coming from veteran artists. Yes, they were ALL new stories... once upon a time. Hurrah for summer fun covers! Cheryl may look off-model on that Kennedy bros cover (it looks like he's trying to draw the TV version of Cheryl), but not nearly so much as Betty ( ... I mean, the blonde who I presume by default has to be Betty ... ), who is practically unrecognizable in facial expression or hairstyle as being Betty. It's ACP's own damn fault though. They let the newer artists just draw whatever they want, and there's no real 'standard version' or 'character model sheet' to go by anymore, so you can't blame the Kennedys if they're getting loosey-goosey doing their 'impression' of the characters now. I definitely gotta get that Robert Hack Jughead cover! Eh, I can't say I see anything of Mads in that. It just looks weird. Quote from: DeCarlo Rules on March 23, 2019, 01:31:59 pm but not nearly so much as Betty ( ... I mean, the blonde who I presume by default has to be Betty ... ), who is practically unrecognizable in facial expression or hairstyle as being Betty. Hairstyle doesn't matter much for Betty. I've seen her with a ponytail, pigtails, hair down (yes, even in modern stories), and even short hair - all in the classic comics. And Riverdale has has with her hair down in addition to the ponytail. So that's not really an issue. What is an issue is she had apparently just gotten a whiff of Moose Mason's sweaty gym socks. Quote from: Tuxedo Mark on March 23, 2019, 07:58:59 pm Hairstyle doesn't matter much for Betty. I've seen her with a ponytail, pigtails, hair down (yes, even in modern stories), and even short hair - all in the classic comics. And Riverdale has has with her hair down in addition to the ponytail. So that's not really an issue. What is an issue is she had apparently just gotten a whiff of Moose Mason's sweaty gym socks. Actually, it does matter. Within the reduced set of artistic cues that define the "Archie style", there are really only TWO ways of distinguishing one pretty girl from another - her hair and her facial features/expression. The hair consists of both the color and the style. Alter either one of those, and you reduce the chances of positive identification of that character. Especially when you're playing fast and loose in drawing the character's facial expression, making it one that's completely atypical for that particular character. What's going on here is that the range of identifiers that signify the character "Betty" have been reduced to just "yellow hair". That's TOO little to go on. Additionally, this is a single image. The done-in-one gag panel in which ALL the visual information must come from a single drawing. You can get away with altering Betty's standard ponytail hairstyle in a single multi-page story, because you get to establish a whole range of drawings of the character. That makes each individual panel (in which you can play with the limits of what visually identifies the character) less important, and in addition to that, you establish a context for that particular story, and get a chance to display the character's personality over the course of the story as the primary confirmation of the identity of "Betty". I'd be a lot more inclined to buy a "throwback variant" if the COVER ARTWORK (and not just the logo) were the "throwback" concept here. 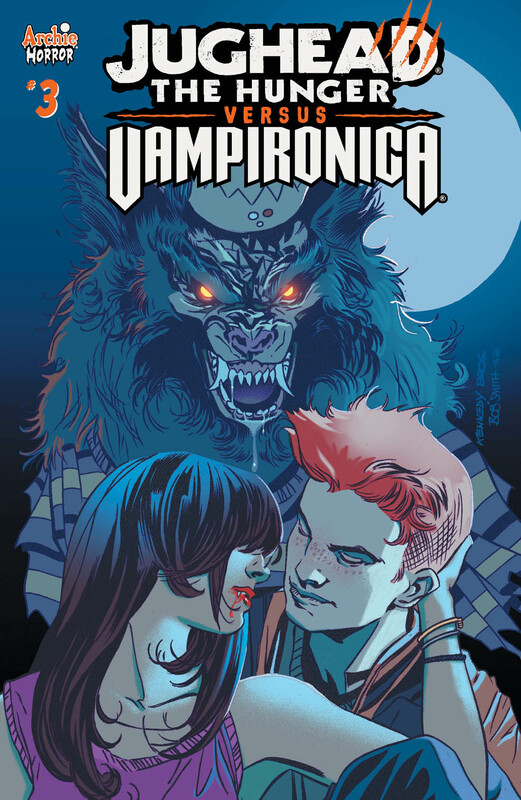 And as it is, why is this the only cover that isn't ARCHIE & SABRINA? Why isn't Sabrina's classic cover logo on there as well? So I'm inclined to just "throw it back". Archie Comics is proud to present our first picture book for little readers! This title follows the footsteps of great children's books like Corduroy and Where the Wild Things Are as being a modern classic for little ones to enjoy. Featuring full page illustrations and easy-to-read text from the masters of DC Comics' kids books. Archie's wildest day ever starts with a cat eating his homework - and things just get crazier from there! But this isn't just an ordinary cat, and this certainly won't be an ordinary day for Little Archie and his friends. Join in on the fun adventure from the superstar comics team Art Baltazar and Franco (Tiny Titans, Action Cat and Adventure Bug)! 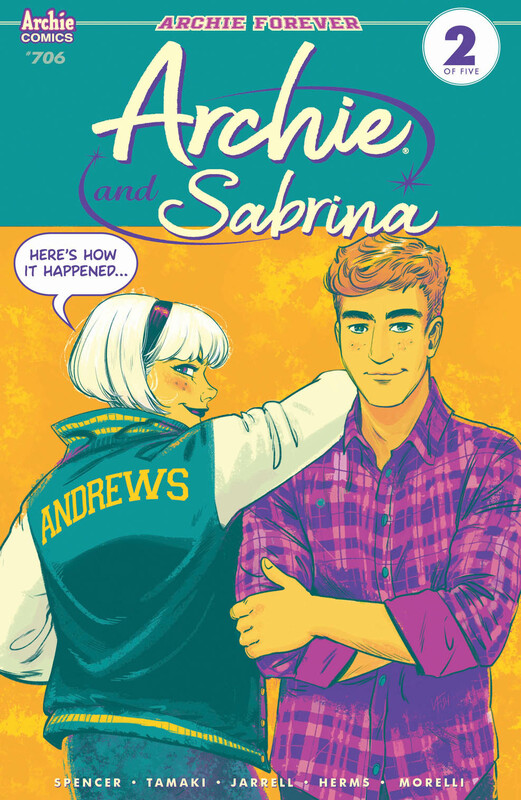 Archie and Sabrina team-up for a spook-tacularly fun coloring book! It's the ultimate treat for those looking to get colorful! Everyone's favorite teenage witch joins the fun as the whole Riverdale gang is back for a Halloween-themed coloring book. There are plenty of costumes, candies and creatures to customize in this latest entry! Plus, each image has an intricate background pattern to add to your color experience. The possibilities are endless and the fun never stops! BETTY & VERONICA SPECTACULAR VOL. 2 is the second in a chronological collection featuring the magazine-format series spotlighting Riverdale's iconic duo. 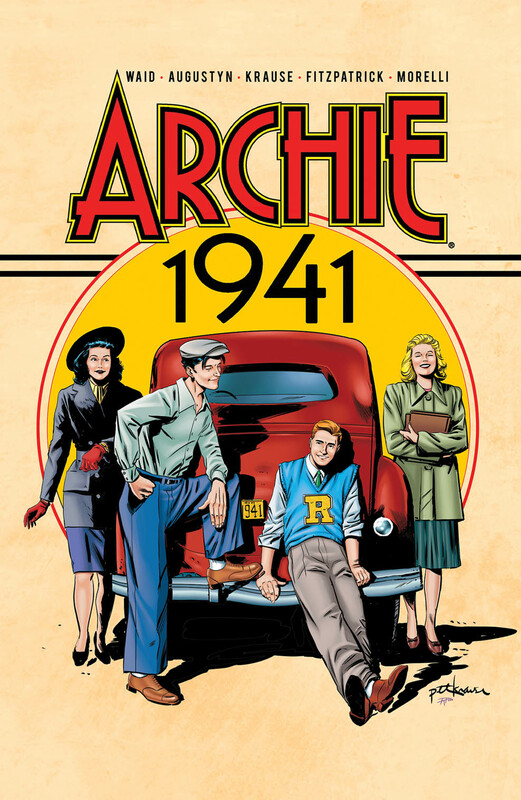 This is presented in the new higher-end format of Archie Comics Presents, which offers 200+ pages at a value while taking a design cue from successful all-ages graphic novels. Betty & Veronica take on the world in this series of once-quarterly stories! See how B&V tackle the world of fashion, prep for the red carpets of Hollywood and still have time to finish their homework! 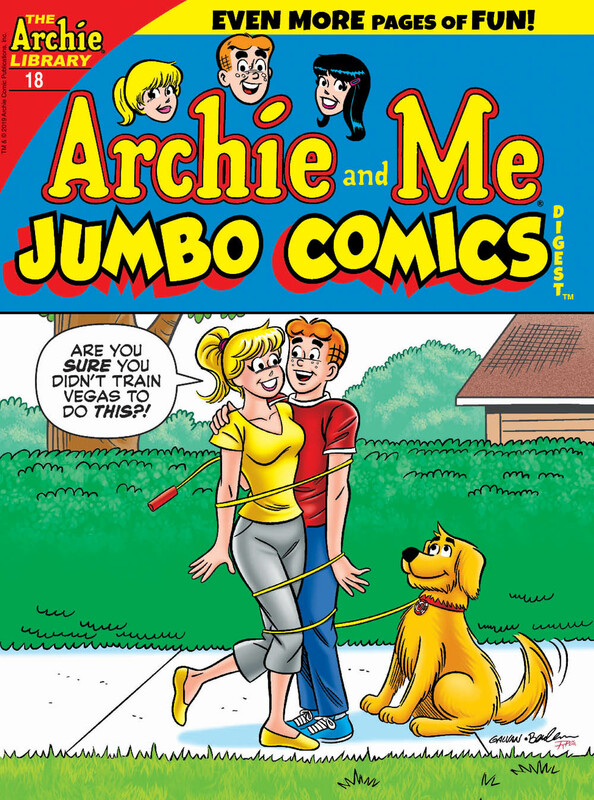 ARCHIE AND ME VOL. 2 is the second of a chronological collection of titles featuring the classic series. This is presented in the new higher-end format of Archie Comics Presents, which offers 200+ pages at a value while taking a design cue from successful all-ages graphic novels. For 161 issues, Archie's craziest interactions with Riverdale High principal Mr. Weatherbee were showcased in this classic series. Now the first dozen are collected here! KATY KEENE Since the 1940s, fashion model supreme Katy Keene has enthralled audiences with her own self-titled series as well as Katy Keene Pin-Up Parade and Katy Keene Fashion Book Magazine. Readers have followed her adventures on the runway as well as her intriguing romances. Best of all, Katy Keene was one of the first interactive comic book series, inviting readers to send in fashion suggestions of their own that were turned into pin-ups and paper dolls that they could cut out and keep! This fully-colored edition features her high-fashion-hijinx! Katy Keene, model/actress/singer extraordinaire, has been an inspiration for the fashion-conscious for years! Now, Archie Comics is pleased to bring you a collection of some of Katy's most wonderful stories! Katy certainly has her hands full with the Hollywood lifestyle she has. Glitz and glamour, famous boyfriends and runway rivals make for quite a balancing act! Can she keep it together and keep her fans wowed? WORLD OF ARCHIE VOL. 1 is the first of a chronological collection of titles featuring the classic series. This is presented in the new higher-end format of Archie Comics Presents, which offers 200+ pages at a value while taking a design cue from successful all-ages graphic novels. Archie takes on dinosaurs, cowboys and the wilderness in the collection of the '90s series! Join him on a journey throughout the world and beyond! EVERYTHING'S ARCHIE VOL. 2 is the second of a chronological collection of titles featuring the classic series. This is presented in the new higher-end format of Archie Comics Presents, which offers 200+ pages at a value while taking a design cue from successful all-ages graphic novels. Back in the days of Saturday morning cartoons, The Archies ruled both TV and radio. While "Sugar, Sugar" was on the airwaves, you could also read the band's adventures in this classic series -- reprinted here again for fans young and old alike! Not only is it NOT all-new, but weren't those same stories just part of THIS recent collection? Let's do a little simple math here. 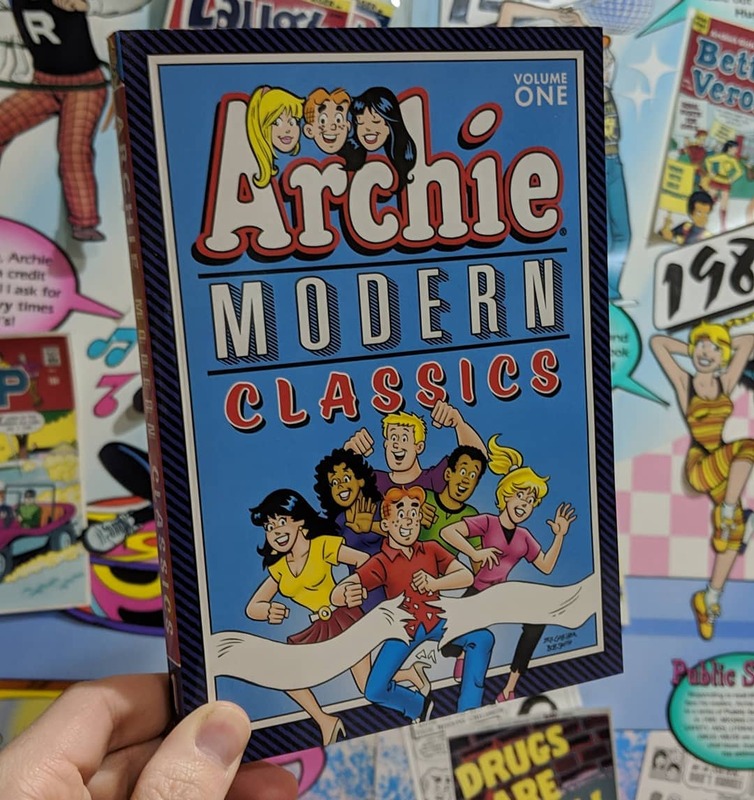 ARCHIE MODERN CLASSICS had 256 pages (which included all of 2018's new Archie digest 5-pagers, as well as the B&V ones), for a cover price of $9.99. The above-pictured B&V FRIENDS FOREVER collection contains only 120 pages of stories, for a cover price of $12.99. Admittedly, by the time this collection comes out it may contain 30 pages or so of B&V stories that didn't quite make it into the Modern Classics book that came out in January. Personally, I plan on taking a pass on purchasing future volumes in the ARCHIE COMICS PRESENTS series such as ARCHIE AT RIVERDALE HIGH and ARCHIE AND ME. The first volumes in those two series weren't all that great. I'm still waffling over whether to purchase a Book 2 collection of EVERYTHING'S ARCHIE. 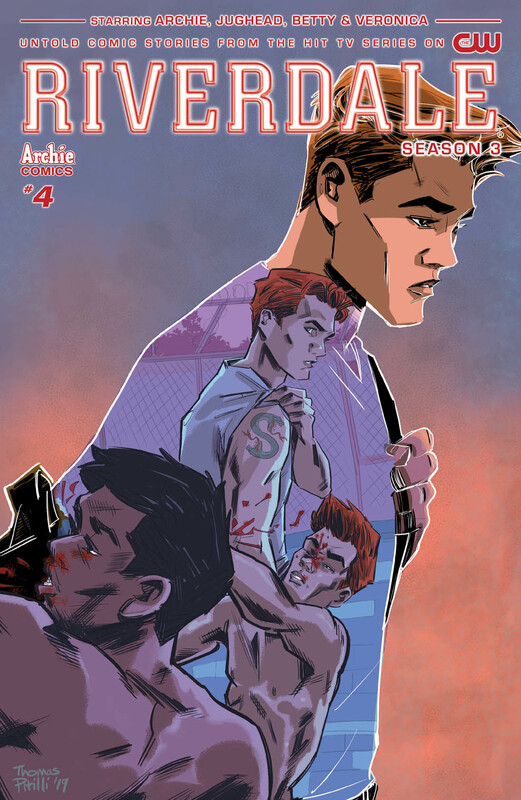 Where the heck is the ARCHIE 1 collection? What about an ARCHIES collection, beginning with the earliest stories of the 3-man combo from Life With Archie? What about a book of the earliest VERONICA stories? And what the hell do they have against poor JUGHEAD? Lots of interesting stuff in that list. I need to start paying more attention to things besides the monthly release announcements.